Our guest post comes from Bonnie & Bill Neely of: Real Travel Adventures Ezine – Your free online monthly travel magazine with hundreds of features and photos on travel to anywhere. We have been straight through Nashville on Highway 40 many times, but since it is en route to visit family and friends we had never made it our destination before. Wow! What a place to spend your vacation! 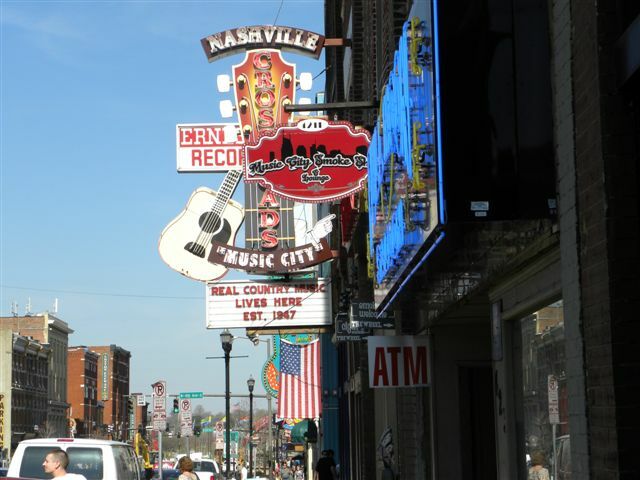 It has something for everyone, and it is known as Music City. We had not anticipated the downtown “District” to be so very unique. With nearly every building unique in design, many depict some form of music instrument or musician in their facades, and nearly everything in the downtown relates to music in some way. The huge glass building (just off Highway 40 at Broadway and 5th) is the unusual visitor center, just in front of the Convention and Tourist Center, which hosts many venues. The Visitor Center is a good first stop for all the helpful pamphlets and some discount coupons for various events. There are lots of terrific souvenirs to pick up here also. Although Nashville is carefully laid out and easy to find your way with a map, the traffic is heavy and many streets downtown are one-way, so plan your stay to do things in one area each day so as not to waste time in traffic. There are many institutes of higher learning in Nashville, and it is also a center for publishing and administration of several Christian denominations. A drive through the campus of Vanderbilt is lovely. A very special, little known place to visit for an hour is near Vanderbilt Campus at 1908 Grand Avenue. It is the Upper Room Chapel and Museum of Christian Art. The exquisite stain glass in the entry and the three dimensional Last Supper over the altar are impressive enough. 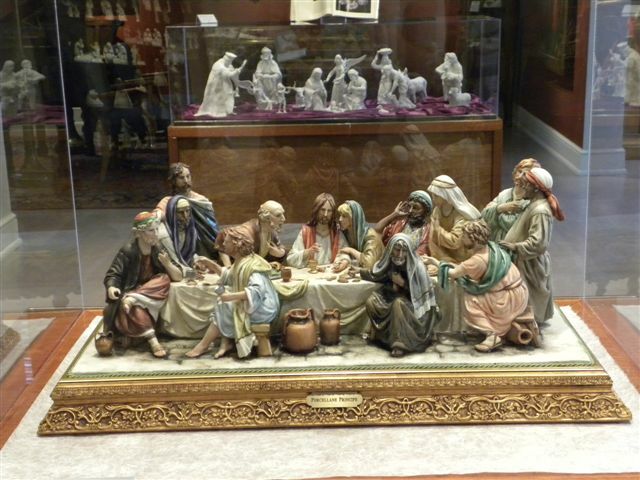 Go upstairs to the Museum to see a vast collection of hand-made Creches, or Manger Scenes from countries around the world. There are other religious art treasures, including some of the first printed and hand-painted Bibles and religious texts and paintings by world renowned artists such as Raphael. We drove out Highway 100 and stopped first at Belle Meade Horse Farm and Plantation for a very pleasant several hours, enjoying the horses and the beauty of the 30 acre surroundings at one of the oldest Southern plantations, famous for breeding some of the finest race horses and winners of Kentucky Derby. The tour of one of America’s Grandest Mansions is well conducted by costumed interpreters. There is also a winery and museum and excellent dining. Then we proceeded to the beautiful Cheekwood Botanical Gardens and the Mansion Art Museum. (The small signs to get there are difficult to see and poorly placed, so go slowly and ask, if you cannot find it.) The art collections are wonderfully displayed within the mansion where we could see the beautiful furnishings of the Cheekwood family home as well as some of their permanent collections, such as the very special exhibit of the treasured primitive limestone sculptures of William Edmondson, the first African American former slave who gained a solo show of his work at the Museum of Modern Art in New York in the 1930’s. He was one day instructed by God to take up his hammer and an old railroad nail and start chisseling. He said, “I’m just doin’ the Lord’s work. I ain’t got much style; God don’t want much style, but he gives wisdom and sends you along.” Edmondson’s creations are uniquely touching. Also in this area, plan to stop for several hours at the nearby Pearson Park to walk the trails with family or pets or play a round of golf on the lovely public golf course. We were hungry after all this and drove a few miles farther on Hwy 100 and discovered the Loveless Cafe and Motel, which is no longer a motel but has kept the name for over half a century. Here we enjoyed one of the BEST meals of our life with the famous, authentic, old-time Southern cooking. In 1951 Annie and Lon Loveless, the original owners, fried chicken and made biscuits to sell right out their front door to passersby. 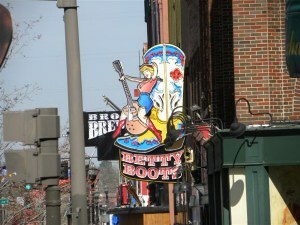 The delicious food became famous and a Nashville tradition. For 29 years Carol Fay has been the biscuit lady, keeping the original recipe secret as she makes about 5,000 biscuits each Saturday and Sunday and about half that many on weekdays, along with her delicious fruit jams. The meals here are well worth the twenty minute drive, and the portions are so big you can ask for a take-out box at the beginning of your meal and take home half for the next meal. Back into the “District” for nightlife, we were so glad we were there on a Thursday night for Country Classics at the Ryman Auditorium, the famous Mother Church of Country Music. A Historic Landmark, the building was obviously built as a church and dates to 1892 when Captain Thomas G. Ryman, moved by a revivalist, built this church for his pulpit. 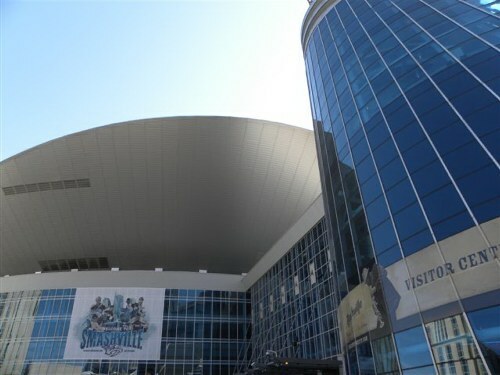 Later the church became the original venue for the beginning of the Grand Ole Opry in 1943, when the radio broadcast of this country concert also began on WSM radio 620AM. The Grand Ole Opry continued here until 1974 when the new Opry House was built on Music Valley Drive in the east of the city. The Ryman Concert was, perhaps, our favorite Nashville experience. The comedy and nostalgic music by some of our favorite country artists of yester-year were so much fun. We simply could not keep still but moved and swayed in our seats. Photos were allowed, and people in the audience and on stage move around to take pictures or change microphones in a relaxed manner, since the show is a radio broadcast, as well. Commercial breaks just add to the novelty of the down home atmosphere of the informal show. It was wonderful! We laughed and laughed and came away feeling young and young-at-heart and very energized by the great music! 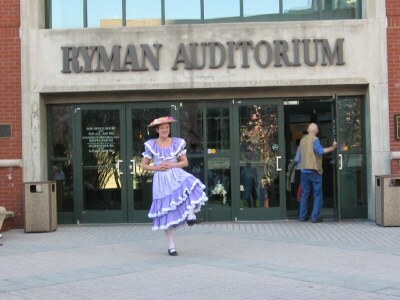 Tours of the Ryman are throughout each day, and you can buy a separate backstage tour. In the entry we saw many cases of memorabelia of famous vocalists and performers of the past. Of course, there are numerous night spots for your nightlife to continue very nearby, especially on Second Ave., where locals, students, and visitors meet for late suppers, drinks, music, and dancing until the wee hours! On your next day you can choose to take any of the many tours available from the desk of wherever you are staying. Grayline offers bus and boat tours. Many people enjoy the Redneck Comedy Tour or the amphibious Music City Duck Tour. We chose to do our own history walks to search out our ancestors, who were some of the first settlers of this area and for whom Neely’s Bend in the tranquil Cumberland River was named. We discovered Fort Nashborough replicated on the banks of the River north of town, directly across from the Titan Stadium. You can take a beautiful walking path along the river and stop to study the historical markers commemorating the brave pioneers who came overland and on the water over 1,000 miles (the longest river voyage in American history). If you have a boat or a fishing pole you can drive to Peeler Park on the Neely’s Bend Road to launch or fish free for a lovely day on the Cumberland River. (No services are here, so bring what you need.) There are long walking trails too. Of course most visitors come to Nashville for the Grand Ole Opry, so plan to have your tickets for Tuesday, Friday, or Saturday nights. The show, with different famous country singers, musicians, and bands, is different each night. At the permanent location since 1974 the Opry House is quite large and beautifully designed, reminiscent of the barn stage of the Ryman but with a more up-scale, modern feeling. Because the performers roam the stage and are shown also on large screens around the curved auditorium, there are no bad seats in the house. It is a delightful just over two hours concert that will have you clapping and cheering and moving to the beat. Of course, you, the audience, are also heard on the radio broadcast in 38 states and by computer streaming around the world. The commercials just add to the fun, as does the constant commotion you see on stage with equipment and artists being interchanged. The whole country atmosphere is at ease, comfortable, friendly, and very informal, as if you are at a barn dance. We loved every minute of it! Consider planning to stop for a worthwhile time before the concert at the adjacent Opryland Mills Mall to shop and possibly to eat in one of the many good restaurants. Johnny A’s nearby on Music Valley Drive is famous for the homemade Southern cooking, open after 3 p.m. If you stay at one of the many hotels, motels, or campgrounds nearby you could spend your time solely in this area built around the Grand Ole Opry. Be sure to walk through the enormous and unusual adjacent Gaylord Opryland Hotel if you cannot afford to stay there. Country Music has a WONDERFUL home in Nashville to share with you anytime! Y’all Come Now!